An Air Force X-37B robotic space plane is shown after it landed at Vandenberg Air Force Base in California. The fourth mission of the program is now underway and just passed 600 days in Earth orbit. 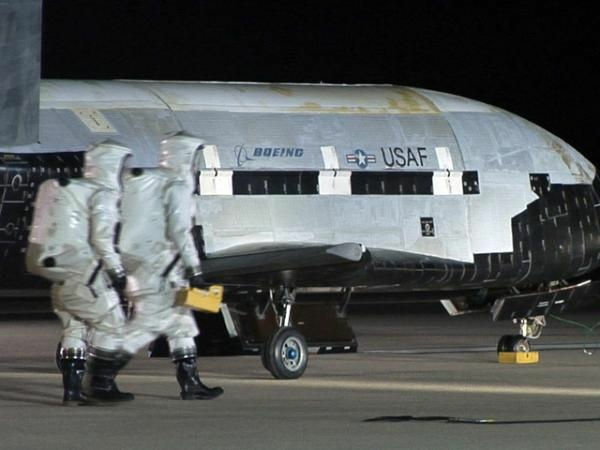 The U.S. Air Force’s mysterious X-37B space plane has now spent 600 days in Earth orbit on the vessel’s latest mission, and is nearing a program record for longest time spent in space. The robotic X-37B lifted off atop a United Launch Alliance Atlas V rocket from Florida’s Cape Canaveral Air Force Station on May 20, 2015, kicking off the program’s fourth space mission (which is known as Orbital Test Vehicle-4, or OTV-4). The first OTV mission began on April 22, 2010, and concluded on Dec. 3 of that year, following 224 days of orbit. OTV-2 lifted off on March 5, 2011, and landed on June 16, 2012, after 468 days in orbit. The record-setting OTV-3 mission chalked up nearly 675 days in orbit, circling Earth from Dec. 11, 2012, until Oct. 17, 2014. All three previous OTV missions have come down to Earth at Vandenberg Air Force Base in California, but that may change for OTV-4’s landing, whenever it occurs.